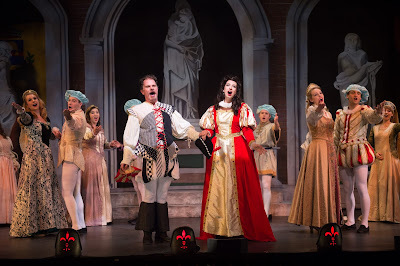 Ohio Light Opera, the lovably enduring shrine to operetta and musical theater, under the dedicated leadership of Artistic Director Steven Daigle and Executive Director Laura Neill, just gets better and better. 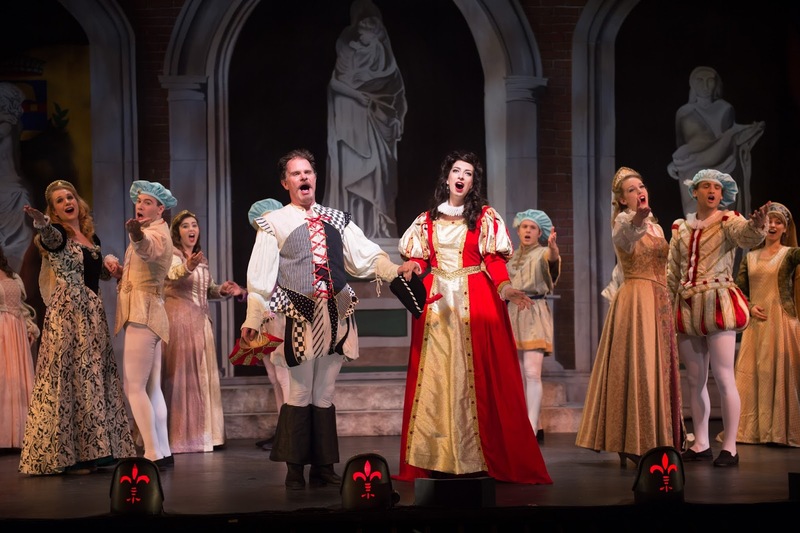 Now in its 38th season, the company continues to astound with its ability to pull off big Broadway musicals and esoteric European and American operetta with thoroughly first-rate aplomb. For here was Irving Berlin’s “Annie Get Your Gun” and Cole Porter’s “Kiss Me, Kate” alongside Offenbach’s fizzy “La Vie Parisienne” and Gilbert and Sullivan’s ever-popular warhorse “The Mikado.” The real catnip for buffs this season, though, were three choice rarities: Emmerich Kalman’s “The Little Dutch Girl” (“Das Hollandweibchen”), Ivor Novello’s triumphant hit of the Second World War era “The Dancing Years,” and Jerome Kern and P.G. Wodehouse and Guy Bolton’s “Have a Heart” from 1917. As before, much of the fun comes from seeing the extraordinarily talented cast members play multiple roles with astonishing skill. Take Alexa Devlin, for instance. One moment she was the hard-working middle-aged innkeeper of the Novello piece, then Hattie, the backstage dresser in “Kate,” then a most commanding Katisha in “The Mikado” singing with rich contralto tone, and then a brassy Annie Oakley the next night, belting out with oodles of Broadway pizzazz and not a whiff of the opera house about her. But this same versatility – albeit not on this high profile a scale – could be applied to virtually every member of the company. 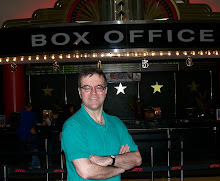 The productions, directed by Stephen Carr (“Kate”), Jacob Allen (“Annie”), Ted Christopher (“Mikado”), Julie Wright Costa (“La Vie”) respectively, all under the aegis of Artistic Director Steven Daigle, who directed “Dutch Girl,” “Heart” and “Dancing Years” himself, were of uniformly high quality. Company member Spencer Reese choreographed all seven shows, and conspicuously raised the bar in that regard; the overall dancing and movement was extremely impressive. “Another Op’nin’, Another Show” and “Too Darn Hot” in “Kate” were especially exciting, though even the graceful period groupings in a “Have a Heart” were striking, too. The sounds from the pit were, as always with this company, consistently satisfying, too. 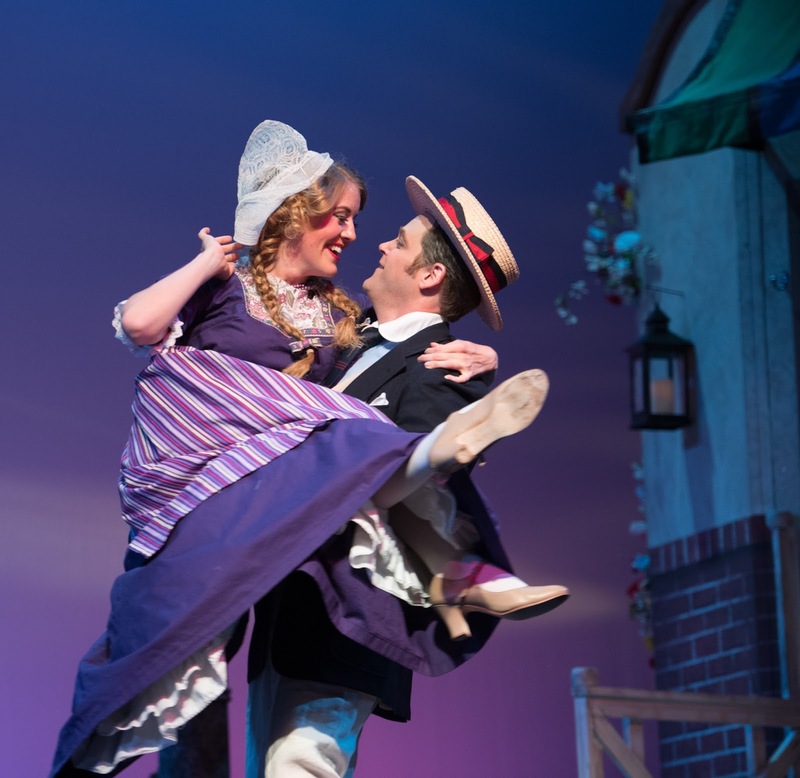 Conductors J. Lynn Thompson (“Annie” and “Mikado” and “Heart”), Steven Byess (“Kate,” “Dutch Girl” and “Dancing Years”), and Wilson Southerland (“La Vie”) all have the music in their blood, as demonstrated by their polished, idiomatic performances. 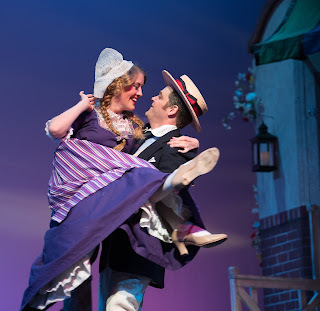 “Kiss Me, Kate” – This was a thoroughly solid version of Porter’s greatest stage triumph. Ted Christopher made as fine a Fred/Petruchio as I’ve ever seen. Mezzo Sarah Best, one of OLO’s brightest lights, took on Lili /Katherine gamely, despite her mezzo timbre and natural comic persona. Still, she’s the closest OLO has to a leading lady, and she carried it off, singing beautifully. Hannah Kurth and Stephen Faulk appealingly scored as secondary couple Lois and Bill, with Kurth delivering originator Lisa Kirk’s big numbers in comparably rich tones, unlike the perky soubrettes sometimes cast in this role, and Faulk applying his smooth tenor to the caressing “Bianca.” Kyle Yampiro and Royce Strider as the comic gangsters advised us to “Brush Up Your Shakespeare” with requisite brio. “Annie Get Your Gun” – Devlin, as previously stated, was a marvel. A powerhouse vocally, and utterly endearing in her dialogue which she delivered with a wonderfully fresh spin. This was the 1966 version emanating from the Lincoln Center revival with Ethel Merman, and thus missing the Tommy and Winnie secondary couple's songs, now apparently no longer licensed for performance. Devlin and Brian’s “Anything You Can Do” and “An Old-Fashioned Wedding” were predictable showstoppers. Unfortunately, “I’m an Indian, Too” was dropped for political correctness. Sarah Best scored hilariously as a loopy society dame in the second act, but all the character parts were well played, including Brad Baron as Buffalo Bill, Julie Wright Costa as Dolly Tate, Kyle Yampiro as Charlie Davenport, and Samus Haddad at Sitting Bull. “The Mikado” -- Happily, political correctness didn’t interfere with a lovely, traditional looking production, very well sung and smartly directed by Ted Christopher, some disconcerting screams at moments of surprise or fear notwithstanding. I wasn’t sure if this was meant to be some sort of homage to something done in samurai films perhaps, but it registered more like the annoying antics of Jerry Lewis. 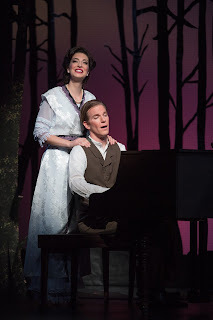 Benjamin Krumreig was Nanki-Poo at my performance, and sang the role superbly.. (The role was double-cast.) So, too, Emily Nelson’s “The Sun Whose Rays” was delicately sung. Samus Haddad made a most imposing Mikado. Brad Baron’s Pooh-Bah was more zany than physically imposing, despite ineffectual padding. The deft use of fans throughout was impressive, again thanks to Reese’s staging of the movement. 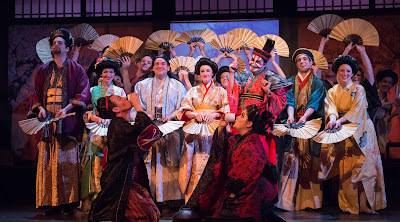 The overture was accompanied by some action involving Victorian patrons (including the Queen herself) engaging in hanky panky in a Japanese teahouse, framing the action with a nod to the Victorians’ actual fascination for things Japanese. Brian’s”Little List” song was duly updated with topical references, and amusingly delivered. “Have a Heart” -- This Jerome Kern gem (book and lyrics by frequent collaborators Guy Bolton and P.G. Wodehouse) was my personal favorite of the bunch. Very prettily designed by Daniel Hobbs -- Act One, a department store, Act Two, a honeymoon hotel -- the original orchestrations were obtained from The Packard Humanities Institute which had been planning a complete series of Victor Herbert and Jerome Kern musicals to be led on CD (complete with lavish booklets and reconstituted scores) until the project was scuttled after an acrimonious falling out with the conductor, the late John McGlinn. Charmingly staged and choreographed, all the players were perfectly cast. 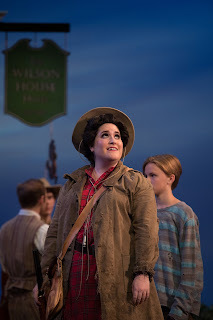 Sarah Best had her most satisfying role here, as Peggy, estranged wife of store manager Schoonmaker (Brian), and delivered the single most ravishing moment of any of the seven productions: a slowed-down version of the song “Peter Pan” exquisitely sung and staged, with a delicate harp accompaniment by Rebecca Simpson. But Tanya Roberts, Stephen Faulk, Kyle Yampiro, Emily Hagens and Isaac Assor were all tops and great fun, and gave a period-perfect account of Kern’s delectable score. Happily, the show was captured for upcoming DVD release. “La Vie Parisienne” – An appropriately fizzy (if sometimes overly busy) rendering of Jacques Offenbach’s madcap modern dress vaudeville as a roué (Benjamin Krumreig) pretends to be a tour guide to a Swedish baron (Ted Christopher) and his wife (Meagan Sill), so he can put the moves on the latter. Christopher stole the show of this one with his very amusing Swedish accent, but there was also standout work from Gretchen Windt (Metella), Tanya Roberts (Gabrielle), and Clark Sturdevant as The Brazilian. The late operetta expert Richard Traubner’s witty 1985 translation was used, but at times, the heavy accents, and Offenbach’s frantic rhythms made the lyrics hard to make out. Southerland conducted with zest and for this production, the entire orchestra was raised up on a moving platform during the effervescent overture, slightly different from the familiar one we know from records. “The Dancing Years’ – This was a genuine treat: a rare (even in England these days) mounting of Novello’s most durable and successful work. At three and a half hours, the work emerged emphatically as a play with music, and indeed leading man Rudi Kleber barely sings a note (nor did non-singer Novello himself in the role). But what a joy to hear the luscious Novello tunes rising from the pit, and to hear the little-recorded “Lorelei” show-within-a-show sequence and other little-recorded numbers like “In Praise of Love” and “A Masque of Vienna.” Though the action takes place in Vienna, this is really a very English show, and it was just a tad disconcerting to hear Novello’s dialogue spoken with plain Yankee accents. Still, Nathan Brian and Sarah Best pulled off their parts of, respectively, the composer whose promise to dewy-eyed teenager (fetching Emily Hagens) leads to a tragic misunderstanding, and the leading lady who takes the composer under wing and falls in love with him. Near the end, the Brian and Best morphed into Ted Christopher and Julie Wright Costa as the older versions of their characters, and the final poignant scenes were quite touching. The work was done with the epilogue of Rudi imprisoned by the Nazis (cut in both the 1950 film, and the lovely 1976 British TV version). “The Little Dutch Girl” – Kalman’s “Das Hollandweibchen” proved quite different (which is to say, far more traditional) than the great composer’s Hungarian flavored scores, only giving way to czardas rhythms in the lively third act ensemble “Hear It…A Song of Love Is Calling.” The piece is filled with impressive pageantry and beguiling melody. This is the tale of a prince, betrothed in infancy to a princess of a neighboring kingdom, who fails to show up on her wedding day. Instead, he bolts to Holland. After her shameful rejection at the altar, the princess follows him there incognito as the titular character (wooden shoes and all), lets the prince fall in love with her, and then scornfully rejects him. Sturdevant, so good in Kalman’s “The Little King” a couple of seasons back, and another performer who shows incredible versatility at every turn, again makes a fine Kalman hero. Meagan Sill’s Princess Jutta demonstrated a strong, slightly steely soprano in the first act, but mellowed most charmingly in her second act disguise. There was fine work, too, from Jessamyn Anderson, Gretchen Windt, and Samus Haddad. After the performance, Yvonne Kalman, daughter of the composer, was brought to the stage where she expressed heartfelt thanks for this work of her father that even she had never before seen. Marjan Kiepura, son of the great Hungarian soprano Marta Eggerth and the Metropolitan Opera tenor Jan Kiepura, gave two fascinating, heartfelt talks about his parents, together with his wife Jane Knox who has become the virtual archivist for her late mother-in-law’s stellar and incredibly long-lived career (Eggerth died in 2013 at the age of 101, and sang with amazingly pure and steady tone till the end). Wonderful archival film clips of the couple’s films (“The Charm of La Boheme” and others), and latter-day footage of Eggerth still in impressive form, all of which generated warm applause, were interspersed with highly entertaining and poignant anecdotes from Kiepura, an especially witty speaker, and cogent commentary from Knox, altogether making for an enormously moving, personal tribute. Britisher Rex Bunnett offered highly illuminating talks on Ivor Novello and P.G. Wodehouse, prior to performances of “The Dancing Years” and “Have a Heart” respectively. His well researched and fascinating lectures were illustrated with wonderful rare photo montages of the men and their works with audio excerpts. He spoke of the timidity of the former’s original producers who shied away from the blatant Nazi elements, cutting the prologue. He showed astonishing footage of Novello’s funeral with throngs of Londoners lining the streets. In his Wodehouse session, Bunnett described the origins of the Princess Theatre shows like “Have a Heart” and pointed out (as Guy Bolton asserted, that these were, in their way, every bit as “integrated” as “Oklahoma!” which is often glibly (and incorrectly) cited as the first such work. OLO Board Chairman Michael Miller offered a most amusing lecture with copious audio examples of plagiarism over the decades, whether intentional or not. Self- borrowing, spoofs, coincidence were also considered. This was a follow-up to his first such droll lecture two years ago. Sigmund Romberg was but one of the high profile culprits. Operetta lecturer, dramaturg, translator, and all-round factotum Daniel Hirschel gave two interesting talks, one on the origins of operetta, and how it has evolved up to the 21st Century, with evocative video clips, though it must be said many were a far cry from the more tuneful works of the earlier ages. His other lecture concentrated on the Cafes-Concerts of Paris, venues for one-act operettas of Offenbach, Barbier, and Herve that flourished from the 1860s. Give Hirschel extra points for chutzpah too. When his PowerPoint video failed at one point, he sang a few bars a cappella. Andras Szentpeteri from Pentaton Concert and Artist Management, who has managed the extensive tours of the Budapest Operetta and Musical Theatre throughout Europe, spoke of the Hungaricum, defined as those things which are the official treasures of Hungarian culture, operetta being one of them. He gave an overview of Hungarian operetta, and described the Budapest company’s great success with revamped versions of Kalman’s “The Duchess from Chicago” and “La Bayadere” among others. He pragmatically stressed the need for new talent, new adaptations, new orchestrations, and so on, to attract contemporary audiences. Roundtables with all the panelists opened and closed the symposium and touched on such topics as each one’s first exposure to musical theater and their respective wish lists for works they’d like to see produced: Sandy Wilson’s “Valmouth,” Paul Abraham’s “Ball im Savoy,” Oscar Straus’s “The Chocolate Soldier,” and Kalman’s “The Riviera Girl” were among the intriguing suggestions. During the daily lunch break, members of the company and creative team -- Steven Daigle, Spencer Reese, costume designer Charlene Gross, and Jessamyn Anderson` spoke of their respective responsibilities, and entertained questions from the audience. Then there was what has become an annual tradition – “Songs from the Cutting-Room Floor” – a concert of numbers cut from the seven shows currently being done. This gave us the opportunity to hear everything from “Let’s Go West Again” (cut from the film of “Annie Get Your Gun”) to a jazzy “A Wand’ring Minstrel, I” from “Hot Mikado.” (the latter, incidentally, most entertainingly delivered by Spencer Reese). Finally, there was a wonderful two-part morning recital (accompanied by Wilson Southerland again) of highlights from two World War I era works: Daigle walked us through the 1916 “Follow Me,” a vehicle for Anna Held, the Ziegfeld star immortalized by Luise Rainer in “The Great Ziegfeld.” Songs were mostly by Harry Tierney, though actually Sigmund Romberg wrote some of the numbers, too. Emily Hagens, Cameron Brownell, Hannah Kurth, and Hilary Koolhoven gave good measure of the ragtime infused numbers. And then Miller introduced songs from the English language version of Victor Jacobi’s “Sybil,” a work he and Daigle hope will, one day, be given a full production at OLO, and based on the excerpts heard here, it would seem to be eminently worthy. Nathan Brian, Stephen Faulk, Katherine Corle, Katharine Nunn, Matt Kelly, and Alexandra Camastro made a strong case for the score. Lyrics were by Victor Herbert’s frequent collaborator Harry B. Smith and Harry Graham. As with the Kalman recital, hearing the OLO cast members singing with piano accompaniment showcases all the more their quality as performers. There was a lot to absorb in these four days, and operetta and musical aficionados were happily bleary-eyed by the end of the seventh performance, but Daigle, Neill, and Miller (assisted by indefatigable board member wife Nan Miller) kept the week humming with spectacular efficiency.